October tends to be the quietest month of the year on the prospect front, but there was still plenty of activity for former and current Red Sox prospects. SoxProspects.com Scouting Director Ian Cundall was on hand for the Fall Instructional League, sending along a trio of Scouting Scratch updates. 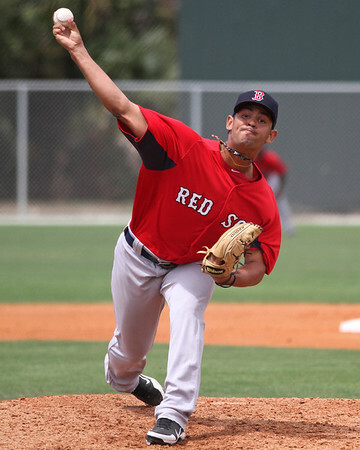 Right-handed pitcher Jason Garcia (pictured) generated plenty of buzz down in Florida. Garcia had Tommy John surgery in 2013 and spent most of this season ramping back up to full strength with Lowell and Greenville. Fully recovered, the 2010 17th-round pick hit 100 on the radar gun. The fall and winter leagues are in full swing. For a full report, check in with our weekly update. Some highlights came out of the Arizona Fall League, where outfielder Rusney Castillo and pitcher Robby Scott were named to the Rising Stars All-Star game. Unfortunately, Castillo was unable to participate and had to leave the AFL due to a finger injury. He may participate in the Puerto Rican Winter League when he is healthy. Now that the offseason is underway, the national publications have gotten started on their annual prospect rankings. Baseball America turned in its 2015 Red Sox Top Ten on October 29. There was very little in the way of player movement, but the Red Sox did re-sign a pair of minor league veterans: catchers Matt Spring and Michael Brenly. Spring split 2014 between Triple-A Pawtucket and Double-A Portland, while Brenly spent the full season with the Sea Dogs. The Red Sox also opened up a pair of spots on the 40-man roster. Utility infielder Jonathan Herrera was outrighted off of the 40-man and elected to become a free agent. Herrera broke camp with the major league squad after being acquired from Colorado, but he had no role after the emergence of Brock Holt. Fellow infielder Carlos Rivero was claimed on waivers by the Seattle Mariners. Free agency starts in full on Tuesday, November 4. On that date, players are free to negotiate and sign with any organization. Shaq Thompson, who went 0 for 39 with 37 strikeouts with the GCL Red Sox appears to have made the right career move. Thompson has been a monster for the Washington Huskies on both sides of the ball. On Saturday the junior played exclusively at running back, running for 174 yards on 15 carries and catching two passes for an additional 41 yards. As a linebacker, Thompson has 33 tackles, two forced fumbles, an interception and two touchdowns on the year. Chuck Culpepper of the Washington Post argues that the two-way standout deserves Heisman consideration. An eighth-round pick in 2011, Senquez Golson turned down a seven-figure bonus from the Red Sox in order to play football at Mississippi. Golson has had an up-and-down career for the Rebels, as chronicled by Edward Aschoff of ESPN.com, but had a career highlight on October 4. His interception sealed the victory over defending national champion Alabama. Golson is second in the NCAA with nine interceptions on the season. Despite his not having played baseball since 2007, the Red Sox selected Austin Davis in the 31st round of the 2012 draft. Choosing to go the NFL route, Davis took over as starter for the St. Louis Rams when Sam Bradford suffered a season-ending injury. The 25-year-old has thrown for 1,785 yards and 11 touchdowns while leading the Rams to a 3-4 record. Some eyebrows were raised when University of Florida starting quarterback Jeff Driskel signed with the Red Sox after Boston made him a 29th-round pick in the 2013 draft. After struggling to start the season, the redshirt junior has lost his starting job to freshman Treon Harris. SoxProspects.com's annual Top 40 Season in Review is into the ten best prospects in the system this week. Catch up here on any write-ups you may have missed, and follow along for the next two weeks as we count down to number one.